If you are going to successfully train a working dog to perform a specific task, you may need to teach the dog to be comfortable while wearing a harness. You can use harnesses for a variety of reasons, from mounting a camera for tactical and police work to fitting a pulling system for physical tasks. 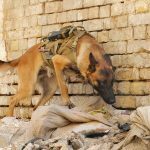 There are plenty of great harnesses on the market to pick from for your working dog, so you should have little trouble locating one that meets your needs. Below we have listed a few of the top harnesses on the market today, in the Nylon and Pulling categories. 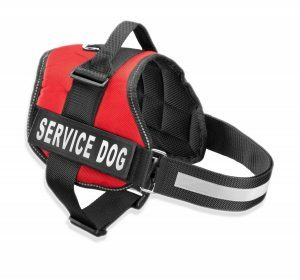 Before you buy your next working dog harness, be sure to review the options listed below. The first product on our list is provided by Industrial Puppy, and it is offered in a number of sizes from XXS on up to XXL. With a modest price tag and large printing of the words ‘SERVICE DOG’, this is a vest that fills a very specific need. If you have a service dog that needs to be identified as such, this is a great vest to consider. With a top-mounted handle on the vest, you can easily grab control of the dog when necessary. Also, this vest is able to accommodate backpacks, meaning you can easily pack along supplies that will be needed for the day. 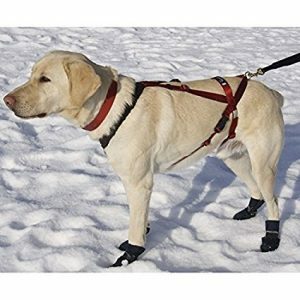 The product is fully adjustable to fit the needs of your dog, and the materials used are meant to hold up over the long run. Many previous buyers appreciate the quality of this harness, so you can be confident that it will be up to the task when you place it on your dog. The previous harness on our list is meant to attract attention with reflective materials and large printing – this harness, however, is meant to do the opposite. 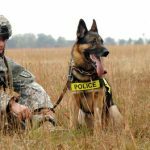 If you need a harness which is going to allow your dog to blend in to the surroundings, such as when you are hiking or hunting, this Tactical K9 Service Dog Training Vest is a smart pick. With two sizes available – small and large – you can select the one that meets the needs of your dog best. Also, there are a total of five colors available to pick from, including Ranger Green, and Black. 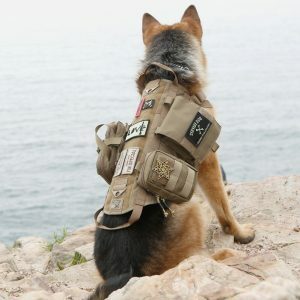 To get the harness into a comfortable position on your dog, you will be able to adjust the chest and belly straps as needed. Also, there is a handle on the back of the harness for you to be able to gain control of the dog, and the product itself is made from 1000D Nylon. A large buckle makes it easy to put on or take off this vest in just moments. If it is going to be necessary for your dog to be carrying items while wearing their harness, this next product is one to watch. With Molle compatibility on both sides of the vest, you can add and subtract accessories as necessary. Three pouches are included with the purchase of the harness to get you started, and more can be acquired if needed down the road. You can pick from three different sizes when ordering your harness, so it should be easy to get the right one for your dog. Also, you can pick from Tan and Black color options when selecting the vest you will order. 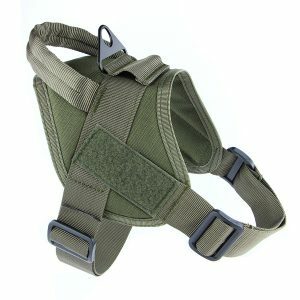 You will need to spend more money to invest in this harness as compared to the previous two items on our list, but that investment will allow you to own a vest that is versatile and can be suited to fit your needs perfectly out in the field. This harness has been well-received by most of those who have purchased it previously, with the quality of the product and the design both receiving compliments. For an all-around, high-quality pulling harness, you will want to be sure to check out the Canine Equipment Ultimate Pulling Dog Harness. This harness comes in four different sizes from small to extra-large, with very little difference in price between the four options. The product is fleece lined to ensure comfort for your dog, and there is padding placed both in the neck and in the shoulders. With a design that is meant to distribute weight evenly along the chest and shoulders, your dog should enjoy pulling while wearing this product. One of the key pieces of equipment included on this harness is the safety shackle snap, which offers a quick release when necessary. The vest is adjustable as well, so you can make sure it fits on your dog just right before you start any pulling activities. The comfort and safety of you and your dog should always be paramount when selecting a pulling harness, and this product places an emphasis on that point. The last harness on our list the Ultra Paws Adjustable Harness takes a minimalist approach to its design, as the harness is made up simply of a series of straps that come together in the correct places on the dog. 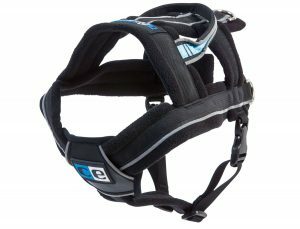 There are two sizes available with this harness – large and extra-large – and the straps are padded throughout the neck and chest area. This harness is not so much suited for heavy pulling as it is for light to medium pulling. Thanks to the presence of a belly strap, the dog should not be able to back out of the harness. One of the unique aspects of this harness which can aid in the comfort of your dog is the floating O-ring which is used to attach the leash near the back of the dog. Rather than having to place the pressure on one specific spot on the harness throughout the pulling activity, the floating O-ring allows for that pressure to be moved around depending on the movements of the animal. This is a nice advantage, and it should lead to an experience that is more enjoyable for the dog in the end. © 2016 WorkingDo.gs All rights reserved.